County Donegal pictures of Ireland really offers some of the most natural and scenic Ireland landscape photos there are . Below are a few with a short description of where the images of northern Ireland are located. One interesting tip is that if you like what you see you can visit a fuller account of County Donegal here which goes into a lot more detail about places to visit which includes Donegal Tweed, Slieve League, Malin Head, Donegal Castle, Bundoran. So with that said here are some northern Ireland photos from County Donegal and a short description of them. 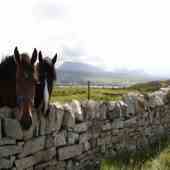 What a view- This is a favourite spot in North West County Donegal. The drive up to Horn Head in North West Donegal takes you out to a really point overlooking the Atlantic Ocean and this one of the well known images of Ireland in County Donegal. There is a car park at the bottom of the hill and a short walk up to Horn Head itself. On a clear summer's day Horn Head is just one of the most amazing places to be. So, fantastic views and good walking ! 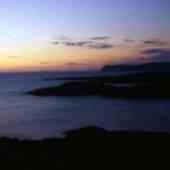 Inishowen is the largest peninsula in all of Ireland. The Inishowen "100" is a signposted scenic drive around the peninsula. 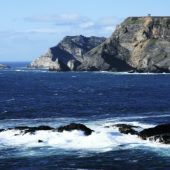 On the route you will pass Northern Ireland's most northernly point, Malin Head. There are just so many beautiful beaches and strands that people like nothing better to find these hidden treasures and just walk along the shore with just the birds for company ! One such beautiful walk is , Saldanha Head ,Stocker strand. Slieve League will take your breath away, that is a promise - the cliffs of Slieve League in Donegal are the highest sea cliffs in Europe. A nearly sheer drop of roughly 2,000 feet separates the Atlantic Ocean from the highest point of the cliffs. 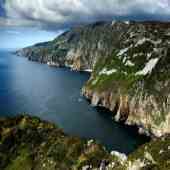 It really is a MUST see and provides a great picture of Ireland and part of its northern coastline. Slieve League is largely untouched by tourism and unspoiled. Road access is a bit of a challenge for drivers not used to heights. The road virtually becomes a single track and there is no margin of error on the seaward side. Go slow ! So that is the first three selected of County Donegal Pictures of Ireland in focus-now another three popular photos of northern Ireland from Donegal. Yes you've guessed-it's rush hour in Donegal!-these two fella's look as if they have their day's work done-not a care in the world ! Well as you can see in the background the countryside is green and lush. Wherever you go you will be struck by this and that is what people love about Donegal-yes you have the hustle and bustle of towns and small villages but you can also be in the country in no time-sometimes in very remote places, just you and nature, peace and tranquility ! This is the tallest peak in County Donegal, Mount Errigal is well known for the pinkish glow of its quartzite in the setting sun. 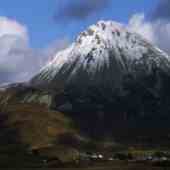 Though it also is well known for its snow capped mountains -yes we get snow here, sometimes sun and even rain! You get a great view from the top of Mount Errigal but bring a good pair of walking boots -cos as we say here the walk up is a wee bit boggy in places! The final one of our selected Ireland images tucked into the rugged landscape of Southwest Donegal, Glencolmcille is a joy to visit at any time of the year. 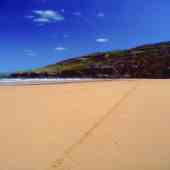 Both shore and hills change dramatically with the seasons, heightening the attraction for the walker. At night some of Ireland's leading musicians play in quiet pubs in Glencolmcille and accomplished singers draw on an extensive repertoire of local song. Bring your dancing feet! Do you have a picture that captures a special moment or a unique undiscovered place in County Donegal?